It is no coincidence that two of Aretha Franklin’s celebrated contemporaries who travelled to Detroit to see the singer in the last stages of her illness were Stevie Wonder and Jesse Jackson. It is hard to overestimate Franklin’s importance to both music and the civil rights movement – and the presence of one of music’s greatest figures alongside Martin Luther King Jr’s right-hand man at her bedside in the final days of her life is a fitting tribute to one of the true greats of Black American culture. Aretha Franklin was the "Queen of Soul". One of the bestselling recording artists of all time, she became famous in the 1960s as a singer with a uniquely expressive voice possessing great passion and control. Her hit songs in the late 1960s tapped into the spirit of the civil rights movement while her hit cover (and gendered re-authoring) of Otis Redding’s Respect was an anthem of black female empowerment. The first woman to be inducted into the Rock and Roll Hall of Fame in 1987, Franklin’s voice was declared one of Michigan’s important "natural resources" two years before. She won 18 Grammy Awards including the Lifetime Achievement Award (in 1994) and presided over a rich recorded musical legacy preserved in 42 studio albums, 131 singles, six live albums and more. Her iconic performances and productions came to define the term "soul music" in the 20th century, setting the standard for black female vocal excellence. The daughter of celebrity Detroit minister CL Franklin, Franklin was born in Memphis in 1942 and raised in Detroit, starting her singing career in the choir at her father’s New Bethel Baptist Church. She belonged to a generation of African American artists who migrated from the south during a time when segregation and Jim Crow law was still in effect, who then went on to participate in mainstream American culture. Her deep connection to the southern freedom movement was familial and spiritual as well as musical – her father was actively involved with Democratic party politics and the civil rights movement. Politicians and activists – along with many of the gospel superstars of the day – were a fixture in the family home. As a result, Franklin received formative musical mentoring from stars such as Dinah Washington and Mahalia Jackson in addition to inheriting a strong commitment to social justice. She was to support progressive politics throughout her career. For people stuck in political struggles for equality and respect, Franklin’s voice came to articulate the collective emotion, frustration, strength and depth of their experiences. Her voice rang out at historical political milestones – at the 1968 Democratic party convention in Chicago that shortly followed the assassinations of Martin Luther King Jr and Robert F Kennedy, and at the inauguration of the first African American president Barack Obama in 2009. She also performed at the inaugurations of Democratic party presidents Jimmy Carter and Bill Clinton. Inspired to follow in the footsteps of Sam Cooke, Franklin began her solo singing career in 1960 performing on the gospel circuit and signing a record deal with Columbia Records. Her first secular albums in the early 1960s blended R&B styles with pop and jazz and achieved only modest success. 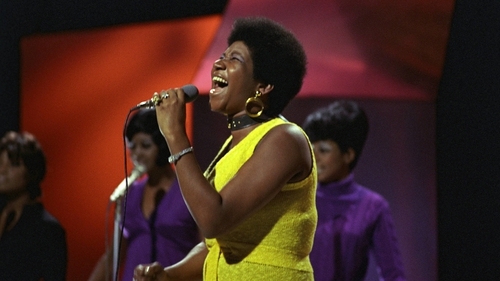 It wasn’t until her move to Atlantic records and a deliberate return to gospel music stylings in 1967 that Franklin made her commercial breakthrough. Recording at FAME studios in Muscle Shoals, Alabama, working in partnership with Atlantic co-owner and producer Jerry Wexler and the legendary Muscle Shoals rhythm section, Franklin’s debut for Atlantic, I Never Loved a Man the Way I Love You, was certified gold in the same year of its release. Her work with Wexler at Muscle Shoals during this period spawned many well-known hits such as Chain of Fools, (You Make Me Feel Like) A Natural Woman, Respect, and I Say A Little Prayer. While she recorded and performed her own compositions from time to time (hit 1968 single and feminist anthem Think is an original song of hers), Franklin earned a great part of her fame as a unique interpreter of other people’s songs. Through gospel-influenced musical rearrangement, and her striking changes to melodic content, she effectively re-authored material written by others, asserting a sense of creative ownership through spirited and dynamic vocal performance. Franklin often altered the context of the existing lyric through her inflection and emphasis or by introducing call and answer interplay with her background singers. These voices of sisterly support were often provided by her very own siblings, Erma and Carolyn Franklin or The Sweet Inspirations (a girl group founded by Cissy Houston and Lee Warwick, the mothers of Whitney and Dionne). Using these techniques, as she did with Respect, lyrics could be repositioned to reflect the black female perspective. Another later example of this can be found in her interpretation of the Rolling Stones’ Jumpin’ Jack Flash in 1986, which was used as the theme tune for the Whoopi Goldberg film of the same name. Music culture owes Franklin a debt for bringing ecstatic pentecostal fervour to popular music, pushing the expressive boundaries of the contemporary singing voice. She was one of the first true great divas of soul (alongside Diana Ross) – fusing gospel and African American spiritual music traditions with the blues, pop and R&B to create the template of vocal expressiveness and authenticity that artists aspire to still. In doing so she set the stage for the technical virtuosity of Whitney Houston and Mariah Carey. A fierce musical talent not only in sensitive and dynamic vocal interpretation but also as a skilled pianist and arranger, Franklin demanded respect from us. And because of her many great artistic and cultural achievements, it will forever be given.